This elegant and interesting book held my attention from beginning to end. It is written in such a refreshing and engaging way that I felt the author was here with me, sitting on the deck and drinking tea as she talked. For all that, it is a scholarly work, written with respect, understanding of non-Muslims, and humour. When I was a very new Muslim I was told that no matter how much one learns about Islam, there is always more to learn. Well, that was certainly true in many parts of this book. 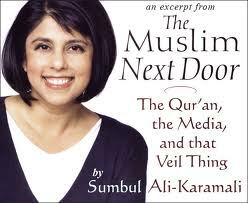 Some things were not new to me but the way Sumbul Ali-Karamali talks about them were and thus I had much to muse upon. One example is the chapter on the Qur'an and the difficulties of quoting from it. Her explanation of the problems of translation left me suddenly feeling as though I was reading poetry and I kept re-reading it. On the basis of that chapter alone I bought two more copies of the book and sent them to friends who, like me, revel in words. 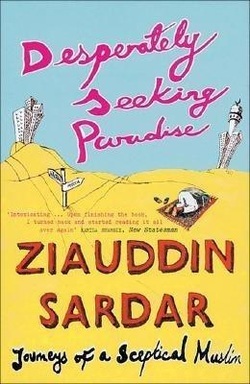 The author is a young American Muslim of Pakistani parentage. She writes in the first person, which I find engaging, and is very down-to-earth in her observations and explanations. Her chapter about women is a ‘must read’ for both men and women. We hear so much about the overall poor treatment of women in Muslim countries, not to mention the Saudis and the Taliban, and it is refreshing to read what Islam really says. I know the Qur’an says it clearly too, but the author’s writing style really brings it home. I recommend this book for both new Muslims and ‘old’ Muslims. It lays the stereotypes to rest and will explain the real Islam to ‘cultural’ Muslims who have been brought up in a tradition heavily overlaid by the culture of their own country. London, Granta Books, 2004. ISBN 1862076502. I was attracted by the title of this book because I interpreted (or, as it turned out, mis-interpreted it) as being about someone who was disappointed with Islam. I wanted to find out why. However, it was a good example of how one cannot tell a book by its cover. It turned out to be an autobiography of a British Muslim of Pakistani origin, who from the 1970s took part in many Islam-related ventures and travelled extensively in his forays into different aspects of Islam. In that sense it was a kind of travelogue of Islam in its various forms. Far from being disappointed, he is a scholar and a passionate Muslim, who nonetheless has a lot of difficulty with the different forms of Islam he sees practiced all over the world. He takes a few pokes at the ummah and then continually puts himself on the line in his efforts to induce changes in thinking. Like many Muslims, he feels the loss of Islam’s golden age keenly. Since then, as we know, Muslim culture and civilization have fallen into an abyss of violence and ignorance. By way of redress he throws himself into movements and publications which try to develop an understanding of modern Islam. I enjoyed the entire book and learnt a lot, but the part that made most impact was his explanation of the troubles of the Salman Rushdie affair. He was equally horrified by the scale of Rushdie’s ‘obscenity’ and by the Ayatollah’s call for Rushdie’s death. If you are a Muslim who is looking for answers, or who is interested in the way Islam has developed since the 1970s, or if you are a bit of a misfit looking for some solace, read this book. I found it to be refreshing, sometimes shocking, inspiring, interesting, informative, thought-provoking and entertaining. Read it yourself and see if you can apply any more adjectives. UWA Publishing, Western Australia, 2011. ISBN 9781742582580. 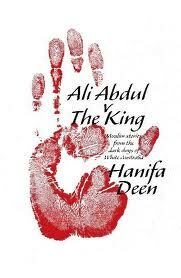 Hanifa Deen’s latest ‘hot off the press’ book is a true joy. The light tone belies the subject matter yet aids understanding and enjoyment. I read it less as a book than as a series of comfortable talks with Aunty Hanifa, as if we were sitting together over many cups of tea. One thing that I found distracting was poor editing, which makes a pedant like me wince. If you can overlook this you will have a wonderful time with this book. It doesn’t talk about Islam, but about some of the earliest practitioners of Islam in Australia. Islam is the thread that binds all the people together but is not a topic in itself. The author tells us that she fell in love with her subjects, She affectionately calls them ‘my men’ and this comes through all the time. Her sympathy and empathy are very evident and add to the overall charm. ‘Her men’ were the cameleers, hawkers and pearl divers whom history and development have taken from us but who nevertheless helped lay the foundation for the lives we live in Australia today. Australians do not fare well in these stories, apart from the odd few, notably Elizabeth Marshall, who, despite being white, gave help, hope and at times a home, to those who were affected by the egregious White Australia policy in force at the time. On the whole, readers could be excused for thinking that the only decent people in Australia were not white. This led me to feel, at times, that to be a white Australian was a mark against me and of course that was uncomfortable. I have encountered this first-hand, in a Muslim organisation, where being the wrong colour and ethnic origin was enough to get me and others like me vilified and discriminated against – strangers in our own country. However, as I reflected on this it made me realize how strong those first Muslims were, to have felt so much on the outside in Australia, because of their colour, their style of dress, their way of speaking, their itinerant lifestyle and their religion. It was galling to read the letters to various newspaper editors, for instance, saying things which would rightly be illegal today. It is only towards the end that we learn that a few white families welcomed the newcomers and developed friendships with them. That said, I loved the personal approach and the wonderfully alluring archival research about a time “… when social justice and non-discriminatory immigration laws were absent from the statute books”. The author makes archival research sound exhausting, frustrating, fascinating and ultimately deeply rewarding. She may well inspire others to subject themselves to the rigours and joys of our national archives in search of similar treasures. This book won’t teach you anything about Islam and is not meant to. Just read it for pleasure and for history, and see if you too can fall in love just as the author did. So did I. 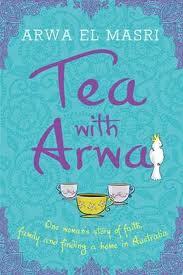 Tea with Arwa: one woman’s story of faith, family and finding a home in Australia, by Arwa el Masri. Sydney, Hachette Australia, 2011. ISBN 9780733627835. A good book can be a rewarding antidote to the just-passed ‘silly season’, which tends to affect even those who do not join in the cultural festivities. This book is a good one, by Mrs Magic. Arwa el Masri comes across as an intelligent, loving, modern Muslim woman. She speaks candidly about her experiences as a new migrant and her early struggles with identity, but she does not stay stuck in that. She is a young woman who keeps moving through her life and it is refreshing to read that. In the process of talking about her life before and after marriage to the charismatic Hazem el Masri (popularly known as ‘el Magic’), Arwa displays her love of family and her love of Australia. She exemplifies how it is possible to be both an Australian and a Muslim, which I, as an Australian Muslim, find a relief from those Muslims who refuse even to try to become part of Australian life. This is an easy and enjoyable read, with a lot of information about Islam woven all through it. It’s a good book for people who simply want to understand more abut Islam and Muslims, as well as for those who are already Muslim. A bonus is that Arwa has included her favourite recipes. As a result I have spent more time in the kitchen than I normally would.